A delegation from Yemen’s former government has left UN-brokered talks in Geneva after representatives of the Houthi ,Ansar Allah, were prevented by Saudi Arabia from attending the negotiations. “The government delegation is leaving today,” said an official from the Saudi-backed team on Saturday, referring to the former Yemeni administration. “There are no expectations the Houthis are coming,” he added. 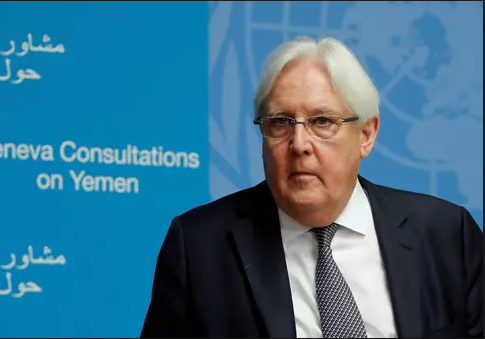 UN envoy to Yemen Martin Griffiths told a news conference that the Houthis were “keen” to get to Geneva. “They would have liked to get here. We didn’t make conditions sufficiently correct to get them here,” he said. Ansarullah accused the Saudis of planning to strand the delegation in Djibouti, where their plane was to make a stop en route to Geneva. It posted a statement , saying the Houthis needed to “ensure the safety of the delegation” and require a guarantee that they would be allowed to return “smoothly” to Sana’a airport. Yemenis took to the streets in Sana’a on Friday, blaming the United States, Britain, and Saudi Arabia for preventing the Houthis from joining the peace talks. “The decision not to send an Omani plane (for the Houthi delegation) was made by the US and it is an American conspiracy with the help of Saudi Arabia,” senior Houthi official Abdulrahman al-Motawakel said. “The US meant to delay the delegation from leaving, and the UN is helpless, and cannot do anything about it,” he added. The agreement was “to provide an Omani plane for the delegation that will participate in Geneva and offer the assurances required for the return of the delegation,” he said. “We saw during the last talks that the delegation was stuck abroad and the UN could not bring them back home,” he added. Yemen has been in turmoil since 2015 when former president Abd Rabbuh Mansur Hadi stepped down and then fled to Riyadh. Hadi then asked Saudi Arabia to launch a military campaign against Yemen, leading to a crisis which has continued to this day. Thousands have been killed in the Saudi-led invasion which has also pushed Yemen to the edge of famine. A cholera outbreak, resulting from the devastation of Yemen’s health infrastructure, has also claimed more than 2,000 lives.